I don’t know if you heard but there is apparently some kind of Acoustic revolution goin' on? I heard it was fuelled by a delayed desire for all the young dudes who want to become Bob Drake or something... You heard about it? Why is this happening? Maybe it takes the end of a millennium and all this technological bang-whizz for something like this: let's get un-plugged from the grid, on mass! It's a mutiny! Or should we just be done with it and blame Freddy Durst…? I’m sure this quiet and calm revolution is just a media myth tho' and months from now we’ll all be moaning about how unjust it is that great records with "real guitars" don’t ever get on Top of the Pops. Examples? You’ve got your Tom Waits’ whose genius never gets anywhere near where it should and a cluster of folks still claiming Captain Beefheart is some kind of messiah. This may be true. It’s certainly those two who are fuelling some of the most lyrically inspired and commercially experimental tuneage around at the moment. 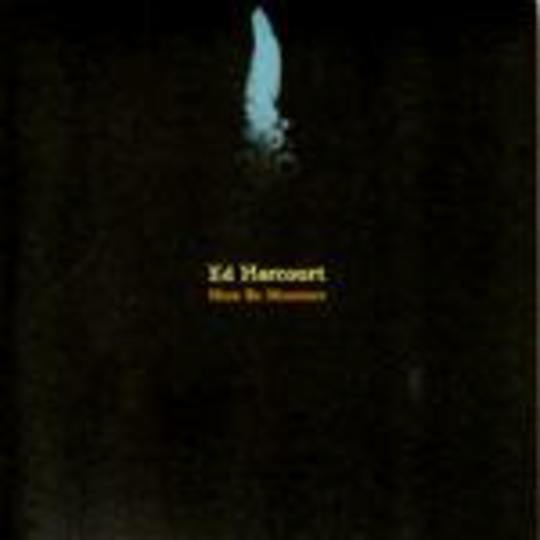 So, in walks Ed Harcourt with his first full album 'Here Be Monsters' following up last year's mini 'Maplewood'. On first listen this album seemed to walk past me - a bit like the time I passed "celebrity" Martin Clunes in the street, and then hours later I remembered who it was... This album is like that - a missed then found sensation. It’s not immediate, but like all good things, it takes time to make some kind of great sense. Take ‘Those Crimson Tears’ it has a ring of [shudders] Coldplay, but unlike the kings of suburbia, Ed manages to sound like it is his heart-shaped tears play the piano whilst in the background someone jams with him on violin. File Here Be Monsters in your record collection somewhere between the subdued summer anthems of Pulp (see: ’Apple of my eye’ with its hand claps, trumpets and lines-of-rhyme like “I’m sick of this angst, don’t need thanks…”), the sonic sound of Spiritualized and, yes, Mr.Harcourt would even be safe on the same stage as The Nu Acoustic Movement's movers and shakers (Turin Brakes, et al 2000-01) ...And for all those of you still wearing Gallagher-anorak’s like it’s ’94 whilst sipping on one pound pints of cider’n’blacks in smelly student union bars, you might like to note that Tim Holmes of Death in Vegas co-produced this album. That’ll make Here Be monsters' easier to file in your collections, I hope. Much like Sparklehorse - the band Ed is about to go on tour with - this album has it’s moments of abstract havoc and ’Beneath the Heart of Darkness’ is the best example of this. With its gradually built walls of feedback, distorted drum machines, piano, rewinding tape samples and brass instruments; that then suddenly stop dead, this is a fairground voyage, but all the clowns are dressed in funeral suits... For about two seconds it’s pure relief as the stabbing static fades and the sounds of discontent are more subtle and distressed. A lone piano then breaks your heart, and it feels great. Hang on, perhaps the piano has come back to save us from the tyranny of "acoustic music"?